1. Do you sell, or want to sell, digital downloads, digital content, products or services from your WordPress site on Autopilot while maintaining total SECURITY of your digital asset? 2. Are you frustrated with the e-commerce WordPress plugins you’ve looked at? Do you want a plugin with reliable customer service (where your questions get answered and issues get addressed)? 3. Do you hate the thought of paying ongoing fees and commissions to sell via a third party web site? 4. Do you hate having to buy many expensive addons after you install a shopping cart? and then pay a yearly fee to upgrade? If you are still reading, then the WordPress eStore plugin may be just what you need! In a Nutshell… this powerful, sleek and conversion oriented WordPress shopping cart plugin allows you to sell any type of digital products and services from your WordPress powered site securely with complete automation. Your customers will love the hassle free checkout experience offered by the WP eStore Plugin. Once you set it up, the whole process (the buying, payment verification, and the delivering of the product(s) without revealing the real URL of the product) works on auto-pilot. You can view a simple overview of the WP eStore’s digital delivery operations here. Yes, you can sell physical (tangible) products with this plugin too as long as you don’t need complex shipping options. Thousands of internet marketers use this plugin to sell their products from landing/sales pages. Automatic instant digital product delivery upon payment through dynamically generated encrypted download link. This way the actual location of your digital product never gets revealed. The link expires after a configurable amount of time or specified number of downloads which ensures the security of your digital asset. Sell services, tangible and non-tangible products from your site. For example, you can sell digital downloads, videos, music, photos, subscriptions, tickets, serial numbers, web hosting, collect membership fees, and much more. WP eStore allows you to embed secure download now buttons for your free downloads (this will prevent hot linking to your files). You can also collect the user’s email address in exchange for the download (helps you build an email list). Simplest one-click checkout through PayPal, 2Checkout, Authorize.net or Manual Payment. Customers can pay using a credit card or PayPal account. Don’t lose your customers to a complicated checkout system. Read the benefits of an express checkout system. WP eStore is a lightweight shopping cart solution. This lean shopping cart structure ensures that the plugin will not slow down your site. When you buy the WP eStore plugin you can use it on as many sites as you own (you gotta love that!). There is no “Developer Option” here. One low price entitles you to use the plugin on all of your sites. WP eStore seamlessly blends into your existing WordPress theme. You have the freedom of placing a Buy or Subscribe button for a product or service anywhere on your blog. Read the design overview here. It can be integrated with Autoresponders (AWeber, MailChimp, GetResponse, Mad Mimi). This way the customers automatically get signed up to your list/campaign for email marketing purpose. WP eStore comes with elegant product display templates which you can use to display your products. Checkout the available fancy product display templates here. With the library of shortcodes WP eStore provides, you can customize your WordPress ecommerce store exactly the way you want it. Designing your online store has never been easier. Checkout the available eStore shortcodes here. 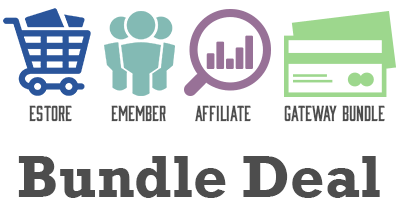 WP eStore has many free addons that you can use to extend the cart behavior in various ways. You get access to all the free addons and extensions when you purchase the eStore plugin. See the addons list here. The eStore plugin has free integration with a lot of popular payment gateways including PayPal, Authorize.net, 2Checkout, BitCoin via BitPay, Braintree, eWay Rapid 3.0, Offline payment method (payment via cheque, cash or bank transfer). There is a premium gateway module to add even more payment gateways if needed (example: Stripe, PayPal Pro etc). WP eStore allows you to create buy now type buttons that offer a super fast product checkout. This type of button allows your customers to purchase a product without having to add it to the cart. You can create PayPal subscription buttons so you can charge recurring payments for a product or service. Ability to allow your customers to save their shopping cart content so that it can be retrieved at a later time. You can configure a product with a bunch of serial numbers or license keys and the plugin will dispatch it to the customers upon purchase of that product. This feature can be useful to sell tickets too. View details here. Create standard or conditional discount coupons using the discount coupon functionality. Use it to allow your customers to buy your products at a discount. Show customers their purchase history. They will be able to see which products they purchased from you in the past. Also allow them to re-download the digital items they purchased. You can use this plugin to sell your products via a link. This can be very useful if you have created a landing page using a landing page creator software and you just needed a link to accommodate the item purchase process. You can enable a “pay what you want” or “custom” price option for your products so the customers can enter the amount they wish to pay for the item. You can specify a minimum amount for the custom price also. Can be integrated with Amazon S3 so that the downloadable files can be stored on your Amazon S3 account and served via secure encrypted download links. Integrates with Google Analytics eCommerce tracking. Your product sales will be tracked in your Google Analytics account (if you are using one). WP eStore allow you to create PayPal donation buttons to collect one-time or recurring donations for a cause. You can choose to deliver a shortened version of the encrypted download links. The links are shortened using the free Bitly link shortening service. WP eStore works with https pages out of the box (useful if you are using an SSL certificate on your website). WP eStore plugin is very handy when you need to put Buy or Subscribe buttons inside a price list or pricing table of your landing page. Ability to list your products on a page using a grid display. There are a few pre-configured grid display templates for your to use. Can be integrated with the NextGen Gallery Plugin to create a Digital Photo Store from the NextGen Gallery to sell photos from your WordPress site. WP eStore is compatible with most popular WordPress security plugins (including our free All In One WordPress security plugin). Can be integrated with the WP eMember plugin to create a WordPress store with membership capability. Creating a membership site with the WP eMember plugin is very easy. Can be integrated with the WordPress Affiliate Software Plugin. So if you decide to boost your sales by introducing an Affiliate Program later then you just have to activate the affiliate plugin. We keep our plugins upto date to work with the latest version of WordPress. We have been doing this for 5+ years so rest assured that our plugins will always be compatible with any future WordPress updates. Scared of getting worthless product documentation after you purchase the product? Checkout the shopping cart documentation before you make a purchase. Tired of listening to fake support promises? Checkout our customer only forum to see how we handle product related issues (usually within 24 hours). Our support forum is moderated by the developers who created the plugin(s). 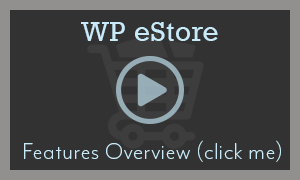 View the full list of WP eStore plugin features. Please see the documentation site to get a feeling for what this plugin can do (this will help you determine if this plugin will meet your needs). Click on the above live demo button to see how the Add to Cart, Buy Now and Subscribe buttons work. You can also watch these set of video tutorials to see how easy it is to setup and use this plugin. 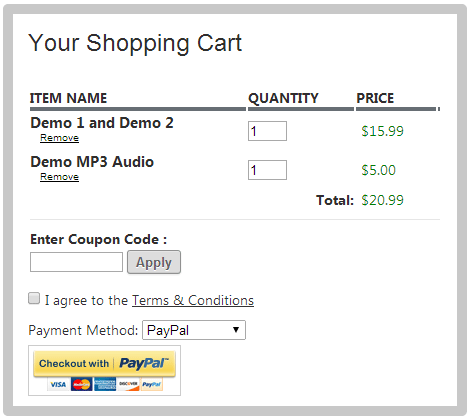 You can also try the free WordPress PayPal Shopping Cart Plugin to get a feel for how the shopping cart works. PayPal Shopping Cart plugin’s checkout is similar to this plugin (it just doesn’t have all the cool features that WP eStore does). The WordPress eStore Plugin can be used to insert a squeeze page type form in a post, page or sidebar to offer a free product to build email list for internet marketing purpose (view details). WordPress eStore Documentation – WP eStore tutorials, how to’s, tweaks and everything else that you need to know about this plugin. WP eStore Forum – The WordPress eStore plugin is simple and easy to use but if you are facing an issue with this plugin then post it on the customer only support forum and we will address it. Thank you so very much. I’ve just set up the new version of the plugin, and a new test PayPal button and as far as I can tell this solution works perfectly! I really can’t thank you enough. Your support has been very fast, and extremely helpful. This made my day! Sleep well at night knowing your digital asset is safe! You will be automatically redirected to the checkout page once you add a product to your shopping cart. you can also find the shopping cart on the sidebar. I am not going to tell you that the WordPress eStore is the best WordPress Store plugin ever but for what this plugin does makes it gold. If you want a WordPress Store plugin that is being actively developed and has someone behind it to offer support and troubleshoot issues then feel free to purchase this plugin. When you buy this plugin you also indirectly support all my other free wordpress plugin development. If you have any questions please leave a comment below. @Mark, You host the files on your server. Alternatively, you can host it on Amazon S3 (if you prefer that option). I’m looking at selling digital items in a PDF format. If this can automatically email the buyer with a download link after payment, where do the files need to be stored, on our web hosting site or yours ? Just wanted to drop in and say how happy I am with this product, I bought the whole package, for launching my first online course, and I was so nervous as I started to get these plugins to work. I have to say that for me, customer support means the most. If a product is super sleek but customer support lacks, I am likely to pass on it. Ivy has been incredibly responsive and kind, the video tutorials are great and the products are working like a charm on my website. THANK YOU !!! Wow, Wow, Wow! Thank you so much for your prompt and personal service. You guys are amazing. A major show stopper for me fixed in 48 hours! Will definitely be using more of your plugins in the future. Thanks again sooooo much.